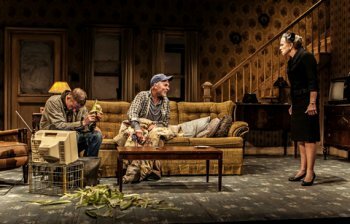 After a twenty year hiatus from the New York theater scene, Sam Shepard’s Pulitzer Prize-winning Buried Child is back in the Big Apple but in a more intimate setting. This latest iteration of the dramatic classic sees its return to the world of Off-Broadway, with a limited engagement at The Pershing Square Signature Center. Propelled with a powerhouse cast led by Ed Harris, the latest from the The New Group is a fresh take on an American classic. On the surface, Buried Child could be classified as an American family drama, but what separates the award winning drama from the rest of the pack is Shepard’s insistence on juxtaposing realism and surrealism. It would be easy to take the linear structure of the play as evidence of a straight-forward family drama, but the overwhelming amount of metaphors and symbolism at the heart of the play stray far from the rules of realism. Set in an old farmhouse in the hills of Illinois, this story follows three generations of a family that at one time came close to reaching the illustrious American dream. There was a budding romance, prosperity and growth from the crops that fed the family business, and then two young boys that completed the much sought after model of a nuclear family. Somewhere down the line things went off the rails and, just as the crops that once produced beautiful yellow corn began to wither away and die, so too did this family devolve into a collection of dysfunctional relationships dedicated to the covering up of a chilling family secret. Meet Dodge, the family patriarch. Played by an utterly transformed Ed Harris, Dodge is rarely seen anywhere other than sitting or lying on the couch—save a few moments of him sitting on the floor. A depressed alcoholic, Harris’ weary-eyed father figure is a cynic, and just his presence on stage impacts the overall tone of the entire play. Consistently, he lacks any sense of optimism, and his overall resolution in life is akin to that of a person awaiting death. Dodge, resigned to spend his days chain smoking and drinking, is constantly at war with the mother of his (now grown) children, Halie (Amy Madigan), who is always nagging him at every opportunity. Dodge and Halie spend more time bickering with each other than anything else, and the cold tone with which Halie approaches her husband is indicative of an empty romance, devoid of affection and intimacy. Madigan, whose character is curiously missing from stage for the entire second act, is always talking about Father Dewis, the town pastor played by Larry Pine. Though she strongly denies she is engaged in an affair, it is heavily implied. One of the most curious characters in Buried Child is Paul Sparks’ Tilden, Halie and Dodge’s oldest son. In a performance best described as unhinged, Sparks’ expressionless Tilden is childlike in manner despite his age. After a mysterious incident occurred in New Mexico, where Tilden lived for a brief time, he was forced to move back to Illinois and live with Dodge and Halie after he proved incapable of surviving on his own, albeit hold a job. Though his role in the family’s dark past is at first unclear, his involvement is increasingly implied with the passage of each scene. Dodge and Halie’s second son, Bradley (Rich Sommer), has different problems than those of his older brother, but problems they are indeed. After losing his leg in a chainsaw accident, Rich Sommer’s jaded and aggressive turn as Bradley is that of a completely emasculated man; a volatile person full of deep insecurities. Things get even more complicated when two characters named Vince and Shelly show up to the house unexpectedly. Vince, Tilden’s son, was on his way to New Mexico to see his father—not knowing that Tilden had moved back to Illinois—when he decided to stop by his grandparent’s house on a whim. Nat Wolff and Taissa Farmiga, who play Vince and Shelly respectively, are a youthful contrast to the elder members of the family present at the house. When Vince arrives at the house and sees his grandfather, father, and uncle, he recognizes all of them; however, bizarrely they do not recognize him. This confounding twist drives the play into a frenzy, and as confusion and frustration reach a fever pitch, the secrets of the family can no longer be concealed and one-by-one come out into the open. 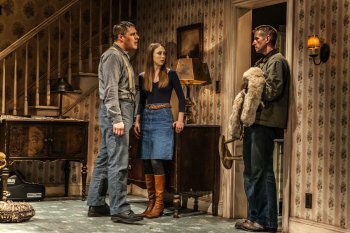 Buried Child is a tornado of a production, and director Scott Elliott tames this chaotic family drama masterfully. At times so thickly laden with subtext and implication, Elliott’s hand at director maintains a brisk pace while allowing for concise moments of tension and intimacy. The set design by Derek McLane is beautiful yet haunting, a fully constructed turn-of-the-century colonial farm house that is minutely detailed and hauntingly realistic. The set is so authentic that it feels as if the house has been dissected in half, and the audience is in secret observing the lives of this dysfunctional family. The stirring lighting design—Peter Kaczorowski—in conjunction with thoughtful but weary costumes by Susan Hilferty rounds out a seamlessly executed production. The New Group’s production of Sam Shepard’s Pulitzer Prize winner is a haunting one indeed. Led by Scott Elliott’s skillful direction, the unravelling of this dysfunctional family’s secrets over an evening of theater is a riveting and exciting occasion. The themes of life and death are on display in The Public Theater’s riveting double bill, "Sea Wall/A Life," two solo plays starring Jake Gyllenhaal and Tom Sturridge. The beloved Lerner and Loewe musical has become a lovely family style entertainment that is now politically correct: “Meet Me in St. Louis” goes to Paris. A funny, but erratic new comedy from Pulitzer Prize-winner David Lindsay-Abaire. A dreamy, surreal character study that lulls while slowly invading the mind’s inner reaches.